Let's start with the basics. What are secured credit cards? As the name suggests, they are cards that are secured by collateral. In other words, you have to make a cash deposit upfront, which normally becomes your credit limit. Your money may be lodged in a deposit account, a money market account or a certificate of deposit, but you won't be able to touch it as long as you have your card. You're so young that your credit report is nearly a complete blank. Time columnist Dan Kadlec recently told the story of his 21-year old daughter, who had never owed a dime, but was turned down when she applied for mainstream student credit cards on the grounds that she had only a limited credit history. You have blemishes on your credit report that mean you're unlikely to be approved if you make credit card applications for unsecured plastic. Credit report repair. One of the best things about secured credit cards is that they can allow you to boost your credit score and repair damage to your credit report. However, not all cards can do that. 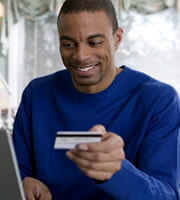 You need to be sure that the one you choose reports your activity to all three of the big credit bureaus. Otherwise nobody will know about all the exemplary behavior you're going to be displaying over the coming months. Annual fee. Just about all secured credit cards come with annual fees. Some are much higher than others, so look out for low ones. Credit card rates. As previously warned, the APR you pay on your new card is likely to be (though isn't always) noticeably higher than that charged on mainstream plastic. However, some issuers rip off secured card customers, and you should seek out the decent credit card companies that offer sensible rates. Of course, if you're sure that you'll always be able to zero your balance every month, then you shouldn't have to pay interest, and the APR issue becomes irrelevant. Other fees and charges. Many attorneys admit that they've never read their credit card agreements, and you can see why. It's not any easy task. However, some credit card companies attach hidden fees and charges to their secured products that can prove ruinously expensive. So bite the bullet, and make sure you know what to expect. Be particularly aware of charges for cash advances and accessing account information, and fees for late payments and going over your limit. 0 Responses to "Choosing and using secured credit cards"